What we call juniper berries are actually small cones — green their first year and then changing to bluish the second year. They grow throughout the southwest at elevations of at least 3,000 feet and frequently in the company of pinon pines. If you’ve ever tasted gin you know the flavor of juniper. 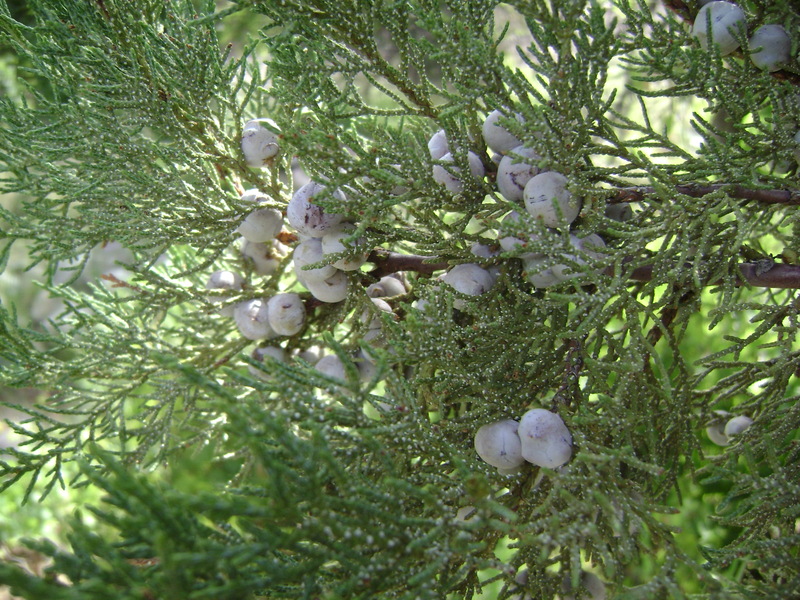 Although gin is flavored with lots of different herbs and spices, juniper is the predominant flavor. Chef Molly Beverly of Prescott College shared with me her recipe for Juniper Berry-Chili Rub for Meat. Molly is a real activist in the Northern Arizona food world. Not only does she keep Prescott College students fed delicious, locally sourced, organic food at the college’s Crossroads Cafe, she also participates in spreading the word on healthy eating. 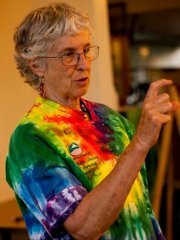 She teaches cooking classes, is active in Slow Food, and writes a column for a Prescott monthly. You can read some of her columns here. Using a blender, grind juniper berries. Add remaining ingredients and grind all of a paste, adding water to keep liquid moving. Rub into meat and allow to marinate, refrigerated for 4 to 6 hours. Roast, basting with excess marinade from pan. wonder if you could substitue chipotle chile powder. would the smokiness blend or contrast with the juniper berries? an xperiment is in order! That sounds delicious. I’d cut back a little on the chile because chipotle, being just dried jalapeno, is hotter than regular chile. But if you like it really hot, that would be a way to go. I’m sure Molly would agree, she’s all about experimenting with flavors. All, please visit Chef Molly’s cafe at Prescott College when you visit the town. It is such a cheerful place, the food is always fresh and delicious. I haven’t had her chili rub, but the cafe’s chili is always among the best, esp on a cold day.